Do you think you know the Milky Way? You don't know the Milky Way. 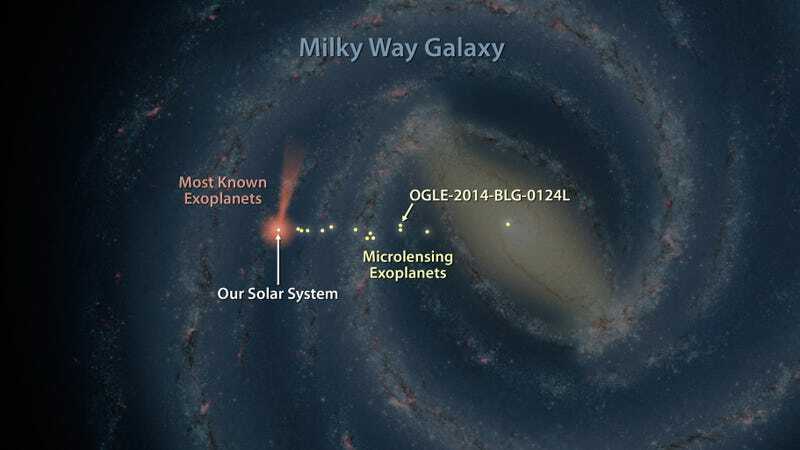 This new galaxy map from NASA shows the exoplanets we've discovered so far, including the newly confirmed exoplanet 13,000 lightyears away from us, catchily-named OGLE-2014-BLG-0124L. It's about half as far away as the furthest exoplanet ever discovered, one of only a few handful to be discovered beyond Kepler's range. The majority of exoplanets that have been found were the work of the Kepler, but the very furthest ones that have been found — like this newest one — owe their discovery to microlensing techniques. Like gravitational lensing, where gravity warps space and light to create a natural "zoom lens" that lets us see further afield, microlensing also makes use of naturally occurring distortion in space. In microlensing, however, that magnification process is caused by a fainter star passing in front of a more distant star, making the space around the distant star more easily visible.